This is a historical company in Colombia. The initial company was founded in 1948, although it had another name at that time, and through different acquisitions and changes it became SUPER in the 80s. Nowadays it employs more than 1200 people. CHAO. Refreshing round dragees with mint flavor. The gums come in stylish plastic containers with flip top or in individual pieces flow-pack. 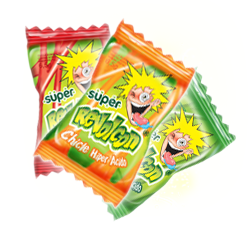 The brand covers also other refreshing products, like chewy candies. BOMBAZO: Individual piece cut&wrap. It is a co-extruded product so it combines two flavors/two colors. The center of the gum is different than the outside and the combinations are: Strawberry-blackberry, Strawberry-Banana, Strawberry-Green Apple, Strawberry-Tutti Frutti and Strawberry-Watermelon. Under the same brand umbrella there are also chewy candies. REVOLCON: Hyper acid individual piece of gum in flow pack wrapping. The acid comes as powder filled in the gum. It comes in four different flavors: Red fruits, cherry-hot lemon, strawberry- apple, and blueberry. LOKIÑO: Lollipop filled with gum. Here is it the link to their website (www.super.com.co) and I thank Ms Lorena Botero for her kindness.